Suits all types of pools. Swimming pool lighting made of acid proof stainless steel with polished front. Under water lighting in the pool creates a pleasant atmosphere. Pool lights makes it possible to use the pool around-the-clock, at the same time as it provides added safety when swimming in the evening. Under water lighting creates a pleasant atmosphere, makes it possible to use the pool round-the-clock and provides extra safety when swimming in the evening. Type A-25RGB, LED RGB colored 25W, 12V, IP68. Complete unit with niche. Type A-28CW, LED White 28W, 12V, IP68. Complete unit with niche. 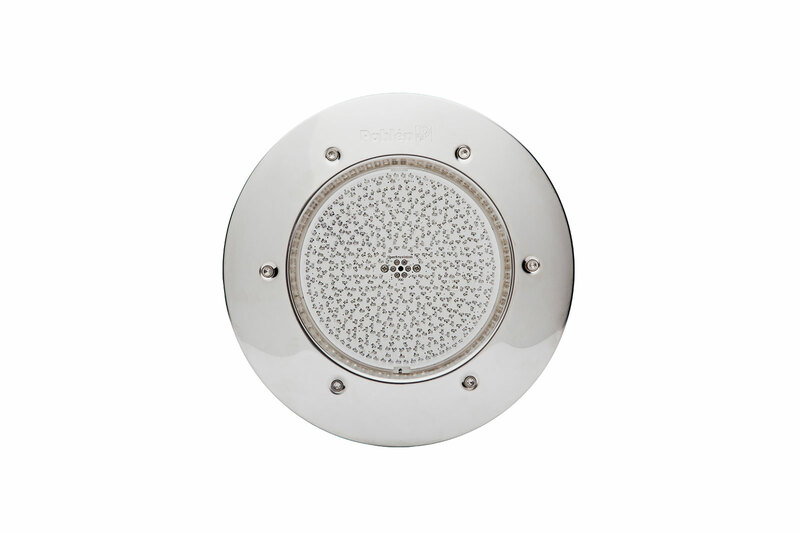 Type A-2, PAR56 White 300W, 12V, IP68. Complete unit with niche. Type CA-25RGB, LED RGB colored 25W, 12V, IP68. Complete with lamp unit, niche, gasket, screws and a flange. Type CA-28CW, LED White 28W, 12V, IP68. Type CA-2, PAR56 White 300W, 12V, IP68. Replacement kit for upgrading Classic existing lighting to Marine.